(left) Martin Evans, artist. Emma Woodhouse. Porcelain figurine. Royal Worcester, “Jane Austen Heroines” series, 1998. Loan courtesy of Joan Doyle; (right) Othello Relates his Story Dresden, Germany, after 1880. Tableau of Othello, Desdemona, and Brabantio based on painting by Carl Ludwig Becker, 1880. Colored pottery. Folger Shakespeare Library. (right) Emily Kaufman, artist. Jane Austen’s Emma Malaysia for Franklin Mint, c. 1998. Loan courtesy of Joan Doyle; (left) Thomas Parr, artist. Charlotte and Susan Cushman as Romeo and Juliet. Staffordshire porcelain, double figure. English, ca. 1852. Folger Shakespeare Library. Pauline Parsons, artist. Elizabeth Bennet. Royal Doulton “Literary Heroines” series, 1998. Loan courtesy of Joan Doyle; James Quin as Sir John Falstaff. Derby porcelain. England, 1765. Folger Shakespeare Library. One of the stories told by the current exhibition Will & Jane: Shakespeare, Austen, and the Cult of Celebrity is that literary renown is as much about commodities as about books. Literary celebrity transforms authors into objects. 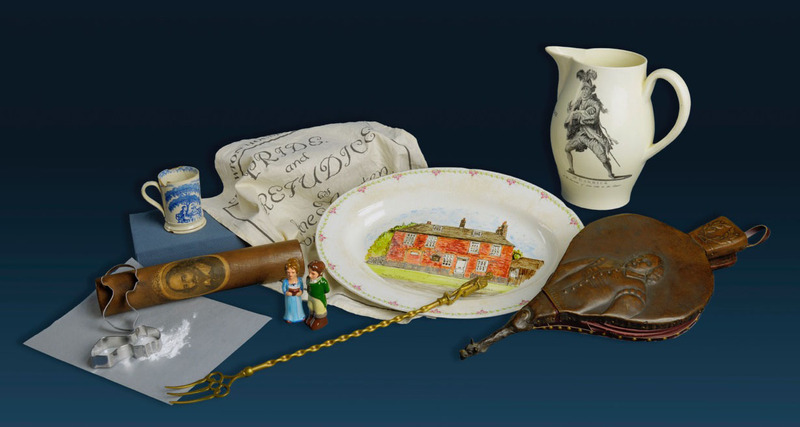 Our exhibition traces this commodification to the eighteenth century, when Shakespeare (like Austen now) was at the 200-year mark of his literary afterlife and when the first trickle of tourists to Stratford-Upon-Avon prompted a modest trade in early souvenirs. Many of these items were crafted from the wood of a famous mulberry tree said to have been planted by Shakespeare himself. Today, we do not need to travel to the gift shops of Stratford (and, for Austen fans, Chawton or Bath) to buy all manner of non-book objects embossed, carved, or printed with the faces of our beloved author and the fictional characters who live so powerfully in our imaginations. Over time, wood and ceramics may have given way to plastic and resin, but the consumer impulse for collectibles has remained constant. Fans still itch to lift their enjoyment off the page (or stage) and take a little bit of Will and Jane home with them. From the eighteenth century onward, fans have brought Shakespeare home in the form of objects to decorate mantelpieces, roll out pastry, hold drinks, and even to wear. Today, Austen’s characters can be used to sprinkle salt at table, while her own image (and that of Mr. Darcy) can be seen on everything from clothing to tea towels. When old Shakespeare souvenirs from the Folger’s art vault are placed next to Austen items advertised on Etsy or Amazon, the juxtaposition makes clear that the merchandizing of celebrities is not a recent phenomenon. In the light of this irreverent mixing of old and new, carefully preserved objects from the Folger’s art vault regain their vibrancy, playfulness, and original pop culture status. These antique kitchen objects were never produced to be museum treasures mounted behind glass, but sold as items for home use. After two centuries, such reverently curated objects are weighted down by the gravity of history, and only when placed beside their modern equivalents do they lose some of that stuffy seriousness that keeps us at a distance. When cookie cutters of Austen’s silhouette are placed next to an eighteenth-century rolling pin made from the mulberry tree planted by Shakespeare, the old object no longer solicits veneration but draws a smile of recognition. Leather bellows embossed with the Bard about 150 years ago are just as silly as salt and pepper shakers in the forms of Lizzie and Darcy today. We are free to imagine the consumers of these much older museum objects as appreciative fans like ourselves—with a similar sense of whimsy about their own devotion to a literary idol. At the same time, our own modern fandom seems less about the crass materialism of commodity culture and more a part of a long history of holding our most beloved authors close by bringing them home. Plastic action figures of Will and Jane might be cheap, but even they partake of a proud tradition, more than 200 years long, of fans actively participating in and shaping a culture of celebrity. The more affordable the commodity, the more fans can be a part of what Will and Jane mean to us. One of the most surprising parallels between the souvenir trade of the first wave of Bardolatry in the Georgian era and the Cult of Jane today is the consistency across porcelain figurines. 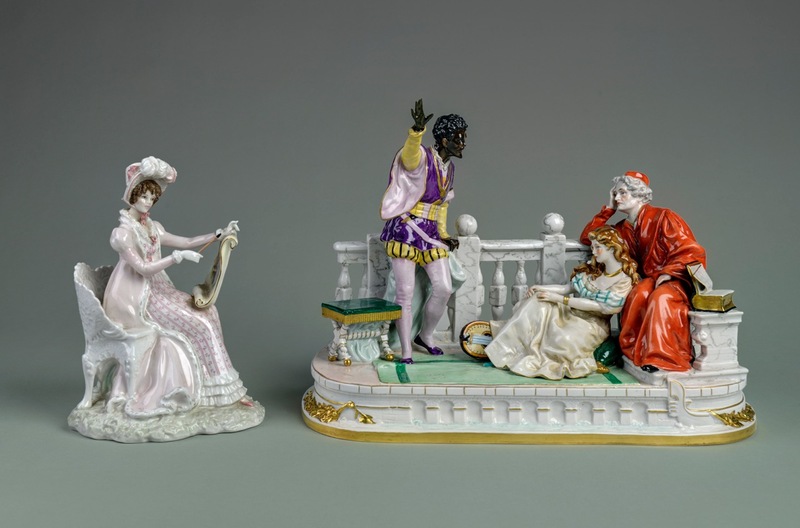 Over the course of the 18th century, inexpensive porcelain manufactured in Europe put collectibles newly in the hands of middle-class consumers, outstripping the sales of imported Asian porcelain as status symbols for the elite. Figures of Shakespeare, his characters, and popular actors in Shakespearean roles were a part of this new and rapidly expanding market in porcelains. Just so, collectors today maintain a strong interest in porcelain figurines of Austen and her characters. 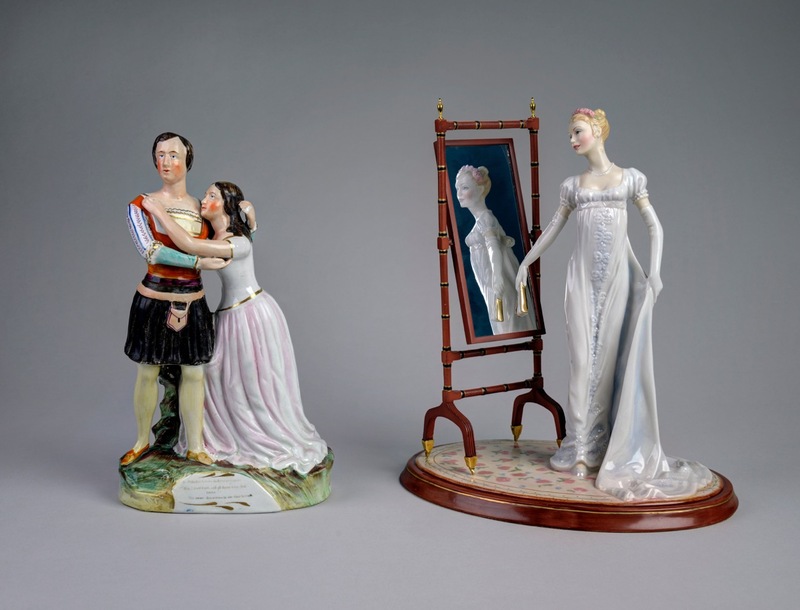 These contemporary figurines are similarly modeled after the actors who embody her characters in dramatizations, although now on film rather than on the stage. For example, a bone china figurine made in 1998 of Elizabeth Bennet resembles actress Jennifer Ehle (who played Lizzie in the 1995 BBC adaptation of Pride and Prejudice) in much the same way that a Derby porcelain figurine of Falstaff made in 1765 resembles actor James Quin (although viewers today may need a little help to recognize him). (right) Pauline Parsons, artist. Elizabeth Bennet. 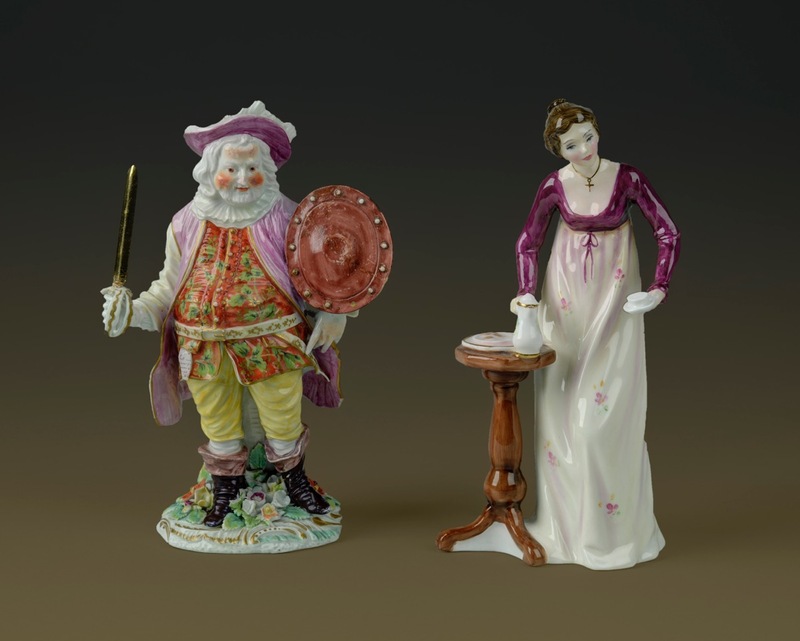 Royal Doulton “Literary Heroines” series, 1998. Loan courtesy of Joan Doyle; (left) James Quin as Sir John Falstaff. Derby porcelain. England, 1765. Folger Shakespeare Library. Similarly, a 1998 porcelain figurine of Emma Woodhouse is the spitting image of actress Gwyneth Paltrow (who played Emma in the 1996 film), just as a mid-nineteenth-century Staffordshire porcelain of Romeo and Juliet is actually a three-dimensional portrait of Charlotte and Susan Cushman, the thespian siblings whose fame grew out of those starring roles. (left) Martin Evans, artist. Emma Woodhouse. Porcelain figurine. Royal Worcester, “Jane Austen Heroines” series, 1998. Loan courtesy of Joan Doyle; (right) Othello Relates his Story. Dresden, Germany, after 1880. Tableau of Othello, Desdemona, and Brabantio based on painting by Carl Ludwig Becker, 1880. Colored pottery. Folger Shakespeare Library. This overriding sense of similarity and déjà vu brings home the central message of an exhibition that compares early Bardolatry to today’s Cult of Jane: the material artifacts of literary celebrity are the deep connective tissue of our culture and its history. And, of course, we hope, part of the fun of experiencing Will & Jane! Interested in collecting your own Will and Jane? Check out the Folger shop! Janine Barchas is Professor of English at University of Texas at Austin. She is also co-curator of the exhibition, Will & Jane: Shakespeare, Austen, and the Cult of Celebrity. Kristina Straub is Professor of Literary and Cultural Studies at Carnegie Mellon University. She is also co-curator of the exhibition, Will & Jane: Shakespeare, Austen, and the Cult of Celebrity.